Layfield operates three construction groups and dedicated service groups in multiple locations. 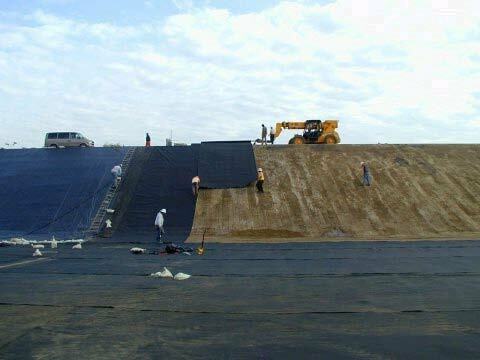 Our construction department specializes in geomembrane and floating cover installations while our service group concentrates on the installation of specialty products including Geotube sludge dewatering tubes, Aqua Dam, Flood Control Aqua Dam, Spray Applied geomembranes, Vertical Wick Drains, and maintenance services. We provide installation services across North America. We place, weld, and test millions of square meters of material each year. Our installation crews are trained in quality control, safety, and project management so that every new Layfield geosynthetic installation is as reliable as the last. From the smallest secondary containment system, to the largest floating covers, Layfield's installation crews are ready to tackle your critical environmental protection project. Layfield offers complete inspection and maintenance services to ensure you get the most out of your floating cover and reservoir installation. Layfield installs prefabricated vertical drains (wick drains) to help drain and consolidate saturated compressible soils.